Unlimited Budget, shown here with Rosie Napravnik at the 2013 Belmont Stakes, is the 2/1 favorite for the TVG Coaching Club American Oaks on Saturday July 20, 2013 at Saratoga Race Course. Saratoga Saturday Shines with Stars: Saratoga opens it’s doors today, Friday July 19th, for the 2013 summer meet. Sure the race card is packed full of stakes races worthy of a write-up, but for us the Saratoga excitement really begins on Saturday when a few of our favorite superstar fillies take the field for the TVG Coaching Club American Oaks and the Shuvee Handicap. The TVG Coaching Club American Oaks is a $300,000 1 1/8 mile dirt race for three-year-old fillies. Five talented fillies are set to take the Saratoga track for the Coaching Club, which is the 10th race of the day at Saratoga with a 5:45 PM EDT post time. Experts like the Todd Pletcher trained filly Unlimited Budget, who recently finished in 6th place in the Belmont Stakes against the boys. Unlimited Budget placed 3rd in the 2013 Kentucky Oaks but prior to that won all four of her races at the beginning of the year. Jockey John Velazquez will break from post position #3 and lead Unlimited Budget across the finish line with 2/1 odds. Princess of Sylmar and Javier Castellano will break from post position #4 in the Coaching Club American Oaks with 9/5 odds on Saturday at Saratoga. The 38/1 2013 Kentucky Oaks winner Princess of Sylmar comes in with 9/5 odds. Jockey Javier Castellano will break from post position #4 with the Todd Pletcher trained filly in the 2013 Coaching Club American Oaks. Princess of Sylmar hasn’t raced since the Kentucky Oaks. Trainer Todd Pletcher has recently stated that the Coaching Club is somewhat of a prep for Princess of Sylmar after owner Ed Stanco (of King of Prussia Stable) expressed interest in winning the Alabama Stakes at Saratoga on August 17th. 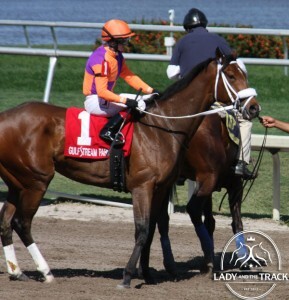 Personally, I think Princess of Sylmar is a monster. She’s won four out of seven races throughout her career so far. But, there is something lacking from this beautiful Princess. I haven’t figured it out yet which makes Saratoga all that more interesting on Saturday! Cue The Moon, with 10/1 odds, will give it all she’s got against the top three-year-old fillies in the Coaching Club at Saratoga on Saturday July 20, 2013. 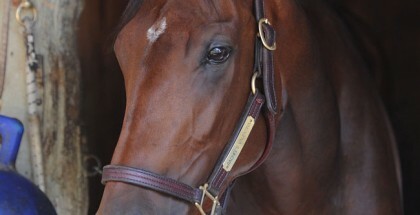 My Happy Face is a fan-favorite filly with a solid win/place record throughout her career. She recently won the Lotka Stakes on June 16th. I would bet with hotshot jockey Joel Rosario on the mount My Happy Face has a pretty good chance at the very least coming in the money on Saturday. My Happy Face currently has 3/1 odds and will break from post position #1 in the Coaching Club. Cue The Moon has cost me a lot of money this year. I can’t help myself and always put way too much money down on the H. James Bond trained filly. Cue The Moon’s track record is steadily on the downward slope. 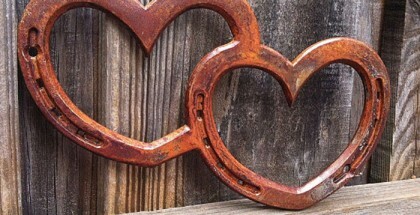 Despite the longshot 10/1 odds and expert opinions, I’m still in love with Cue The Moon. Jockey Luis Saez will take the mount this trip, which I think is a favorable change for the filly. I’d take Cue The Moon over Marathon Lady, who comes in with 5/1 odds. Eblouissante will attempt to live up to the reputation of big sister Zenyatta and impress her adoring fans in the Shuvee Handicap on Saturday July 20, 2013 at Saratoga Race Course. In related news, the 2013 Shuvee Handicap is set to take place just before the TVG Coaching Club American Oaks on Saturday July 20th. 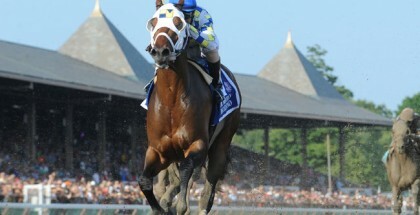 The $200,000 Shuvee is for fillies and mares three-years-old and up and run on Saratoga’s 1 1/8 mile dirt track. The Shuvee is the 9th race of the day with a 5:12 PM EDT post time. What makes the 2013 Shuvee Handicap so special to us? Eblouissante! 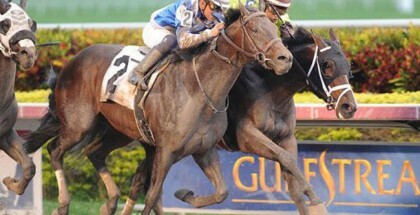 Eblouissante is a four-year-old filly that has only raced twice throughout her career. She won both of those races the last being on January 17, 2013. What makes Eblouissante so special? 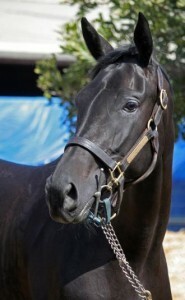 Eblouissante is half-sister to the great Zenyatta and her name means “Dazzling” in French! What else could a girl ask for? Eblouissante will attempt to win her first stakes race against six other talented fillies and mares. Some experts like the look and style of Moon Philly, with 15/1 odds. Moon Philly will break from post position #4 with jockey John Velazquez. Lady and The Track would like to wish all of the contenders in the 2013 Shuvee Handicap the best of luck. Good Luck! Safe Run!